I signed up for their 3 hour course (with lunch) on Slow Cooking, and half way through the meal I turned to the man next to me and said ‘I want to live in South London.’ Not true (I blame the wine). 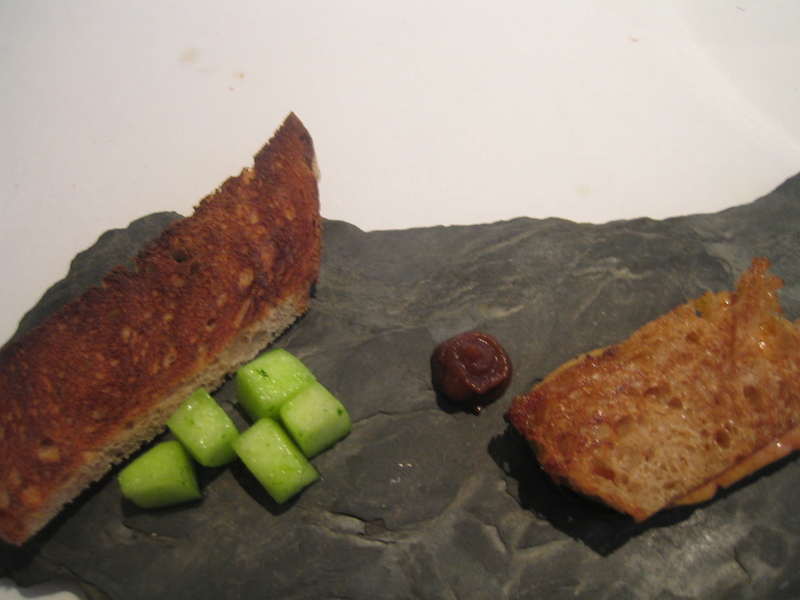 What I meant was ‘I want Trinity to be in North London.’ The food is delicious, the room relaxed and informal, the staff faultless, and the bread so stunning I can envisage trekking here regularly just to be near it. Sous-vide literally means cooking things under pressure, in a bag under water. When I was a kid, ‘boil in the bag’ was synonymous with slimy white fish drowning in claggy white sauce. 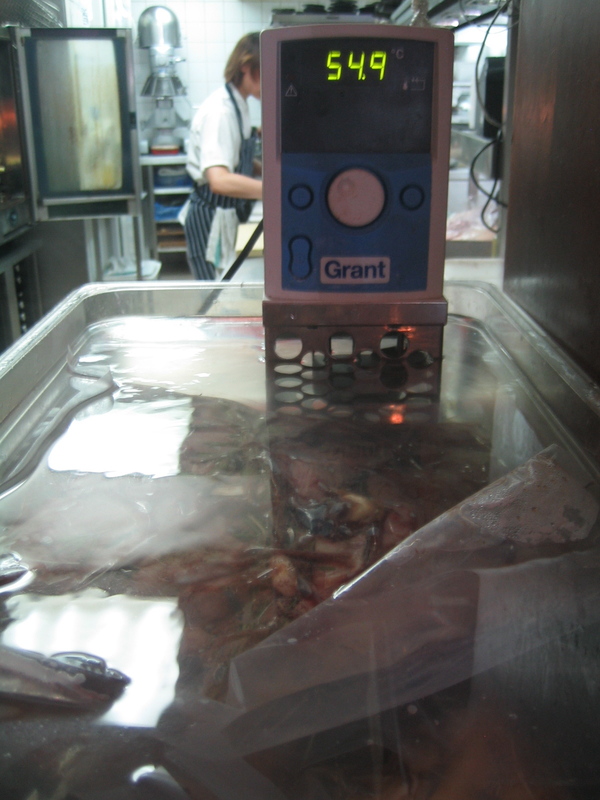 However sous-vide is a long-established technique used in many of the world’s best kitchens. 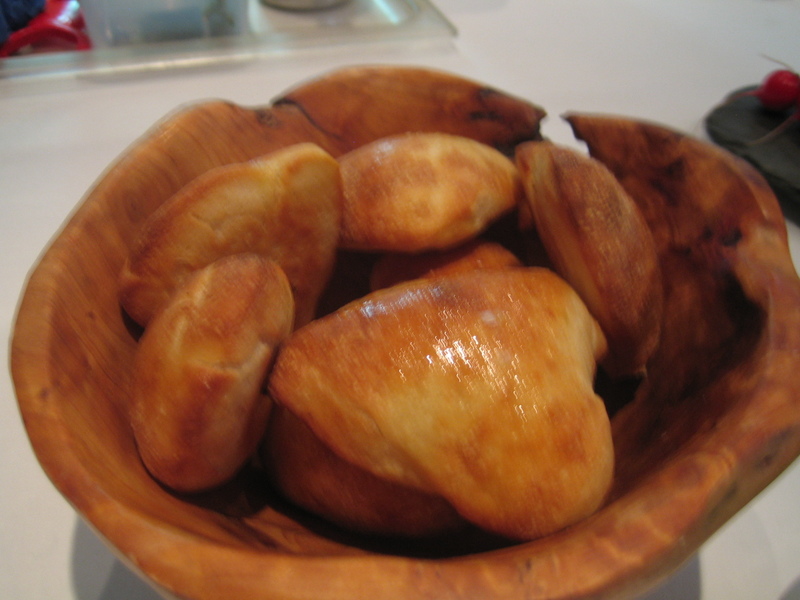 ‘Boil in the bag’ is a slight misnomer – the water tends to stay at a lower heat than boiling – but the bag part is key. Meat, fish, veg, even fruit can benefit from enhanced texture and flavour. Certain cuts of meat benefit particularly from the process – for example neck, shoulder or bavette. The collagen relaxes in the water bath and the membranes break down, transforming tough cuts into tender. With sous-vide cooking you can very precisely control your end result, ensuring consistency across the board – key in a restaurant context. That’s the thing – sous-vide is not super-practical for the domestic cook. 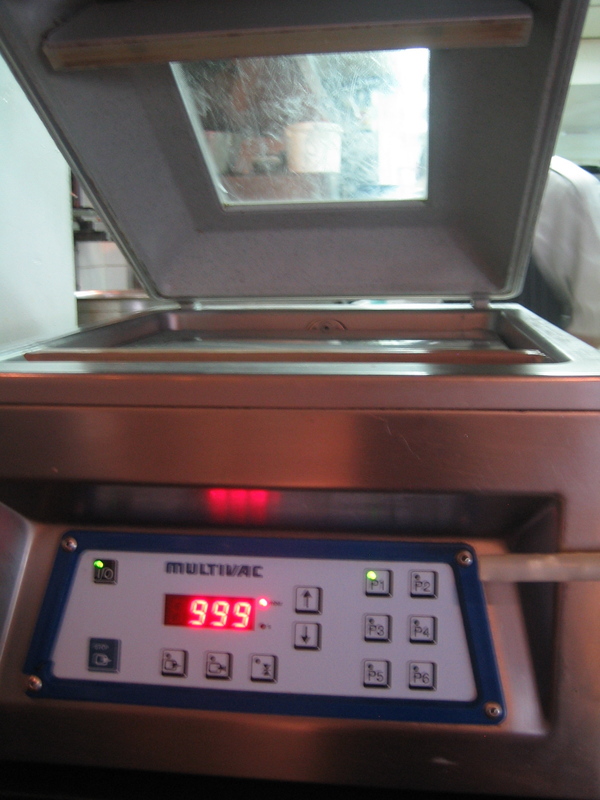 While you can fashion your own water bath, maintaining and monitoring temperature can be a pain – and of course your food needs to be properly vacuum-sealed. If you want the restaurant style kit, it’ll cost you – around four grand for the vac pac, another grand for the water bath. So, prohibitively expensive for non-oligarchs. Plus the two machines take up a lot of space. Of course if you have dug out the basement of your oligarchy Knightsbridge home, alongside your home cinema, pool and panic room you could own a lovely little sous-vide set up – but then you probably own a lovely little in-house chef who you keep in the basement too. The class was run by Trinity’s sous chef, the charming and talented Graham Squire, who talked us through general techniques and the science behind them – and then through a specific menu that we were fortunate enough to eat. 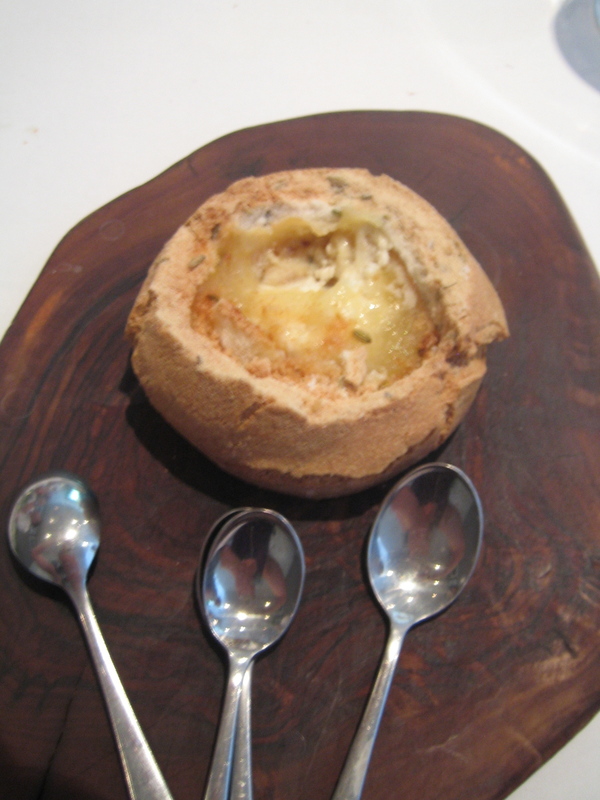 The class is not hands on (we didn’t cook) but even better it was mouth on. Along our way Graham fed us various delights, including melt-in-the-mouth foie gras, and the crackliest crackling outside of a Krakow crack den. Above you can see some of the ingredients that went into our lunch. The Granny Smith was vacuum packed but not sous-vided which enhances the intensity of flavour and texture merely through the vac-packing process. Salmon is a good fish for sous-vide-ing; because of its high fat content the fish doesn’t dry out in the way a skinnier fish might. 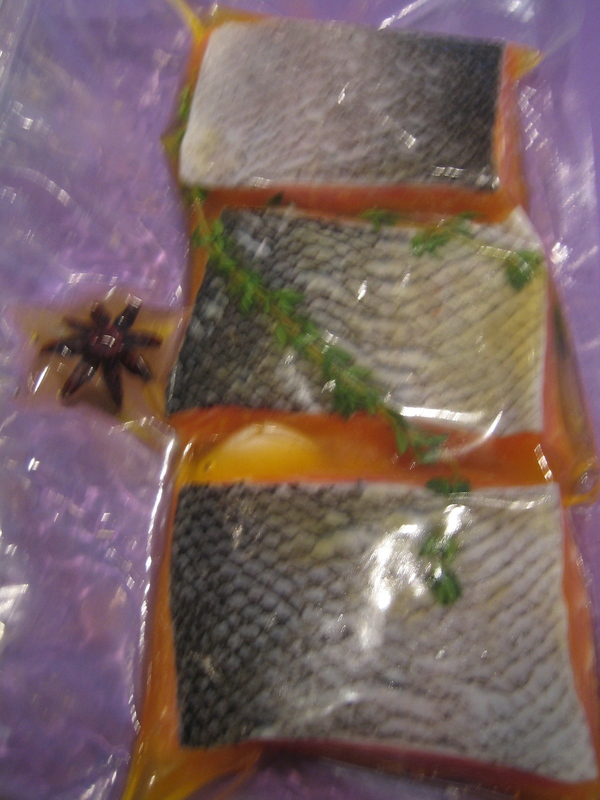 These are Scottish Loch Duart salmon fillets – vacuum sealed with star anise, thyme and garlic. The garlic is kept whole – water bathing brings out the intensity of flavours, due to the long, slow hanging out time. 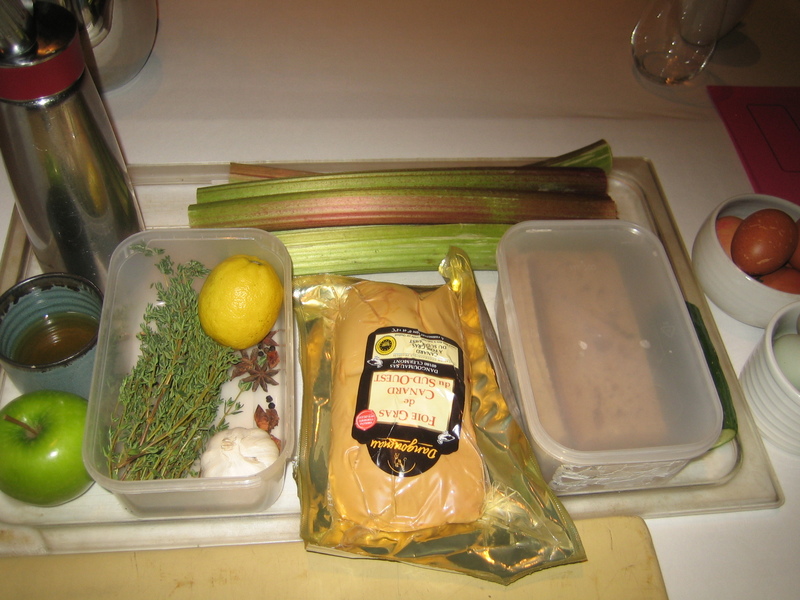 Graham confitted the salmon in the bag with clarified butter, at 55 degrees for 20 minutes. 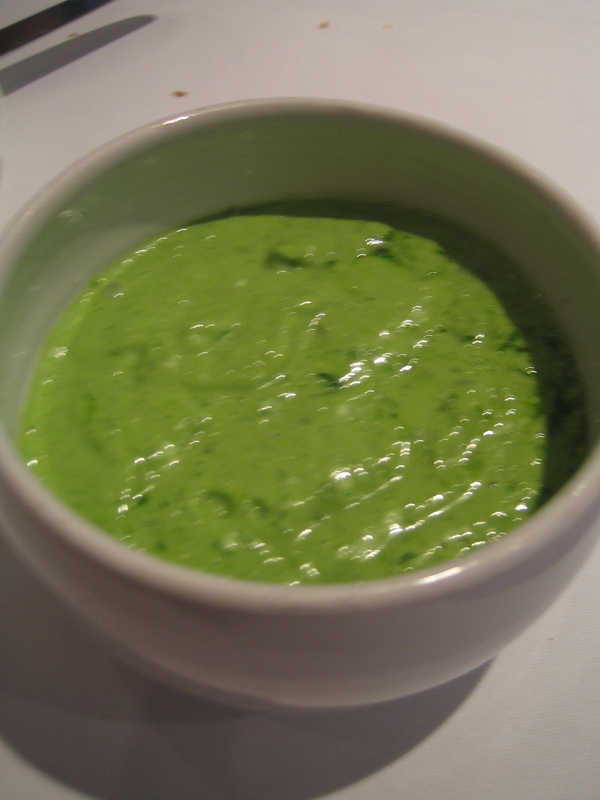 After sticking the fish in the bath he made a delicious chive oil in a Thermomix which he rapidly transformed into a chive mayo. 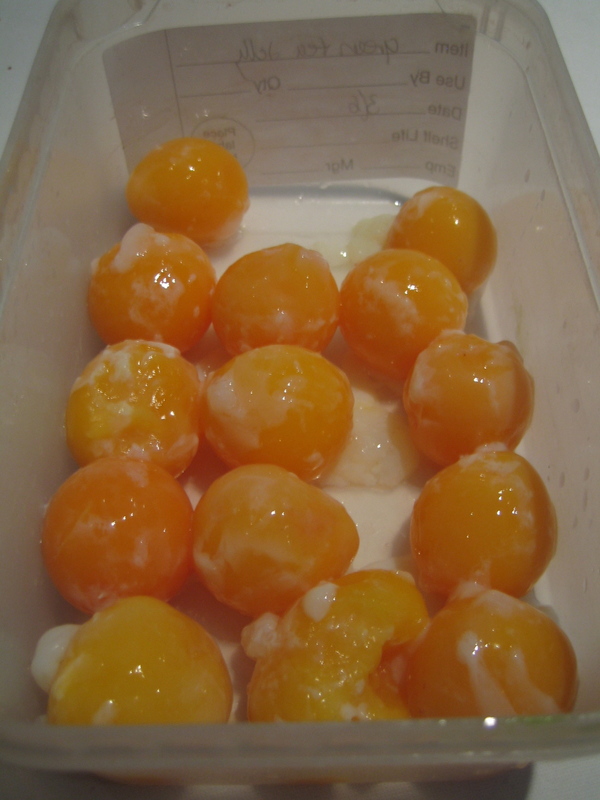 He also water-bathed some eggs for 48 minutes at 68 degrees, giving him the yolks you see above, which he then chucked in the Thermomix and made Hollandaise with. 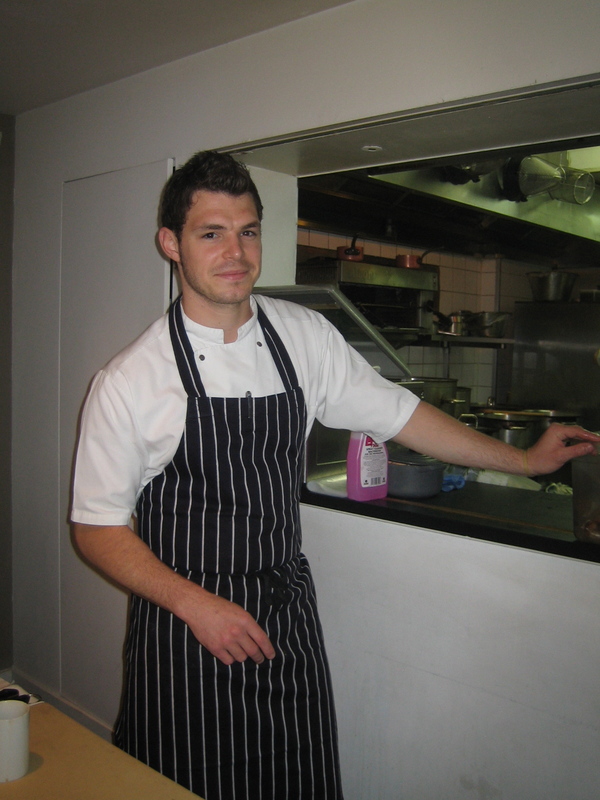 Graham explained that because Hollandaise can be notoriously tricky to make (dangers of the curdle) – using eggs that you can fully control ensures the process is fool-proof. Then it was time for the main event – an amazing 6 course lunch featuring many of the ingredients he’d water-bathed for us earlier, Blue Peter style. 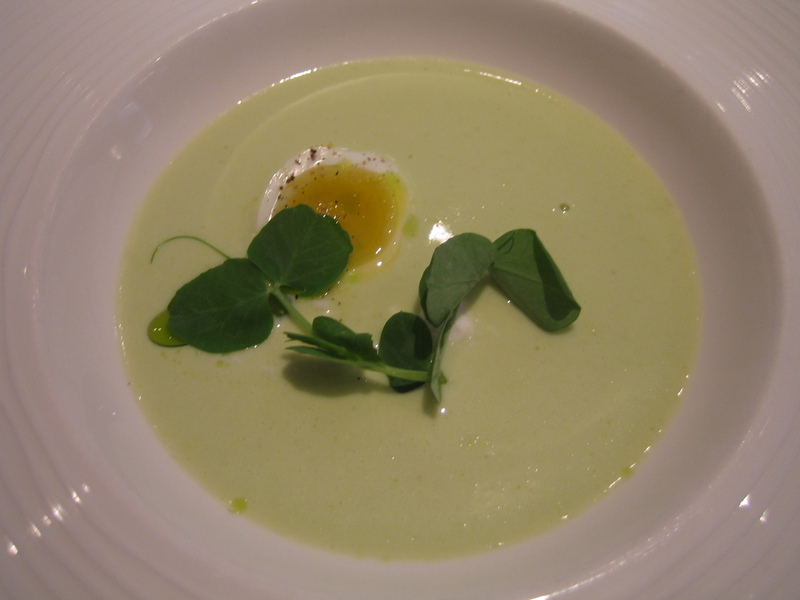 First was coddled pheasant egg (he’d been in the bath) with asparagus vichyssoise. 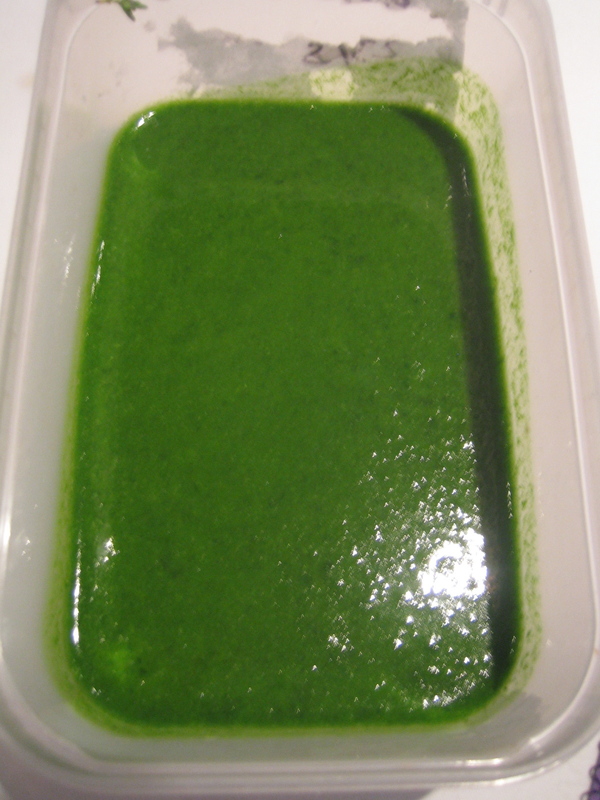 Alongside the egg under the surface of the soup is a spoonful of home made curd, and on top some home-grown pea shoots, along with a little bit of the chive oil from earlier that had been hung to remove sediment. 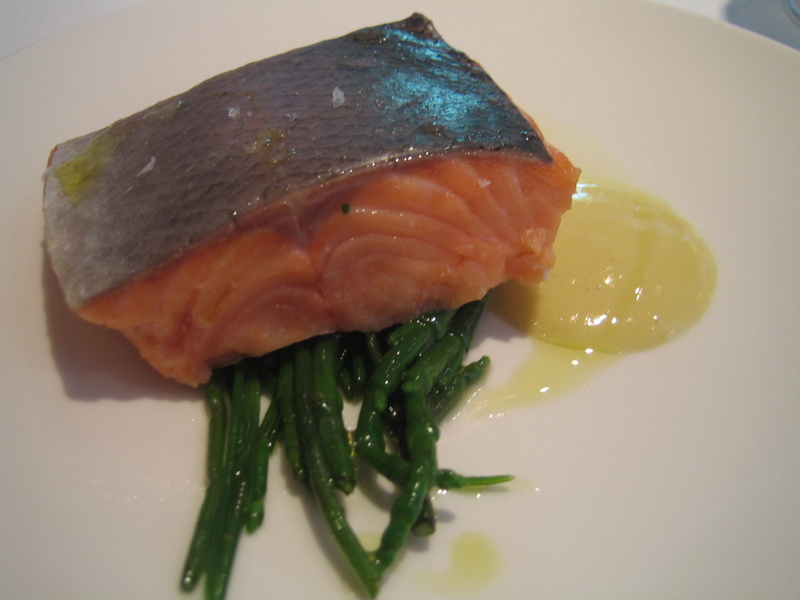 Then the salmon, served with samphire (aka sea asparagus – I do like a sea vegetable with a nickname), monk’s beard and lemon beurre blanc. One day Steve Jobs will invent technology that will allow us to truly experience texture on a computer screen. Till then you’ll have to get by on the amateur pic above. 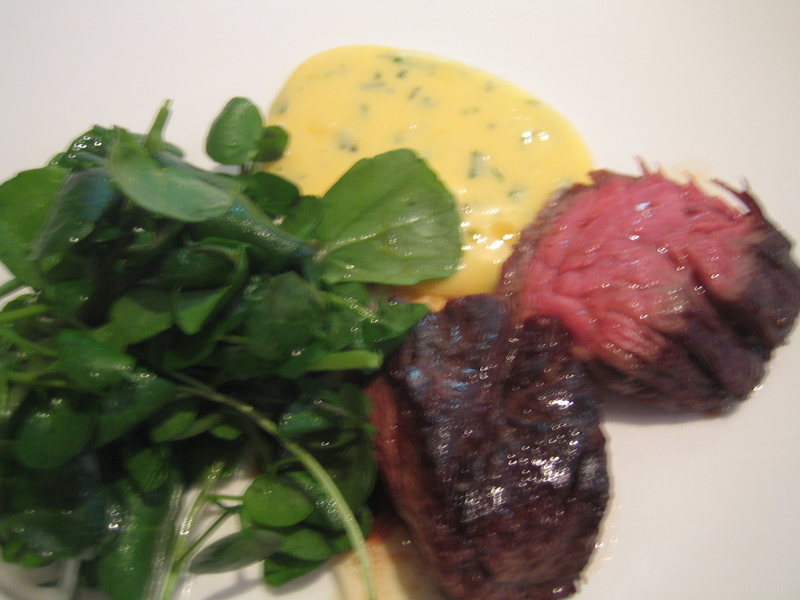 And then there was more… the slow-cooked bavette, who we’d discovered in the bath when we arrived. He’d had a four hour bath at around 55 degrees, followed by a flash pan fry to give him a beautiful crisp exterior to show up his lovely pink insides. 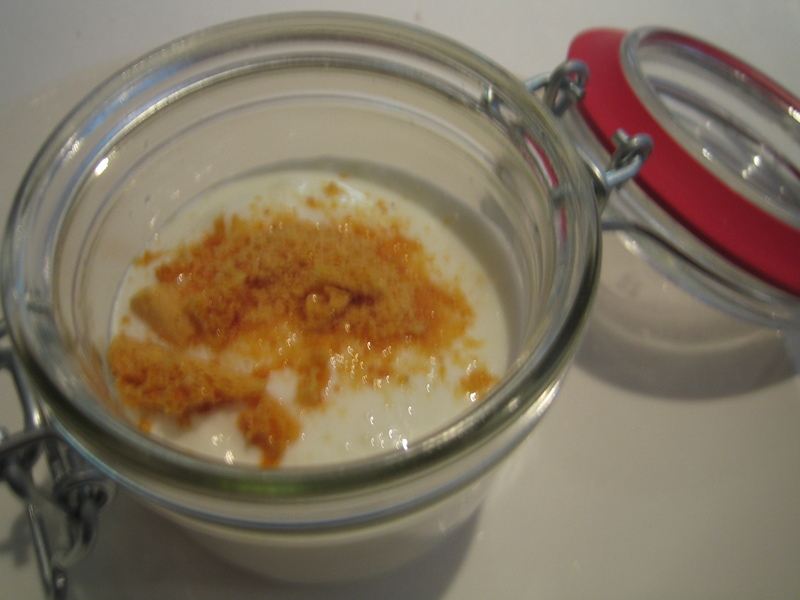 And then a little pre-pudding pudding of foamed yoghurt with apricot compote, honey comb and nut crust. 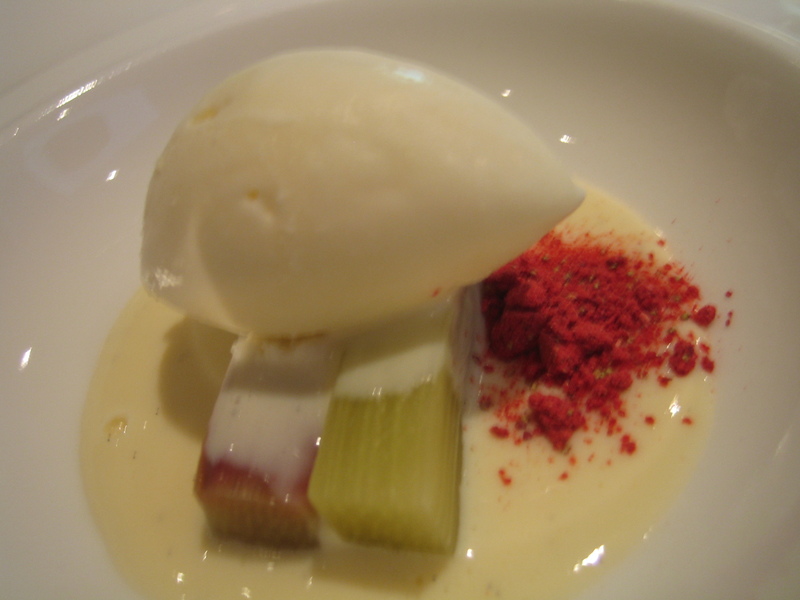 And finally warm rhubarb (also bathed – so liberated, so Swedish, all these fruit, veg and meat bathing together…) and custard, served with milk ice cream and strawberry dust. I wish the dust in my home was strawberry dust – would be much more fun doing the housework…. All in all it was one of the best 4 hours I’ve had this year – certainly the best 4 hours I’ve ever had in Clapham. There were six of us on the course – perfect as it felt very personal and special. You could ask whatever silly questions you wanted. And the whole thing, including a faultless 6 course lunch, wine, and a brilliant introduction to the world of sous-vide cost £50, which I would have paid for the food alone, let alone the booze and the education.